always coming home | A record of our permaculture experiment in embracing the kind limits of the flowering earth. May our small steps serve all life. This is a formal invitation to the new Elaborate and Beautiful Failures Club. You’ve already joined. We already started it with high hopes and ambitious plans and it already fell completely apart. There’s nothing else to do around this. It’s going back into the ground now. We can all relax about it now. If you think a plant is “bad” or “useless,” it just means you don’t know how to work with it. If you read this, I don’t want you to feel judged or to judge yourself; to feel like you’re not good enough or not doing enough; I want you to help me hold this question and help me understand what it means to be human in this time. We live in the woods and try to each year reduce the number of corporations and industrial systems we rely on. Part of my reason for doing something this comprehensive is that there were all these truths that kept coming into my awareness that I couldn’t ignore. There were consequences of my American lifestyle both far reaching and immediate that, once I knew about them, I could no longer live with. There are simple questions you can answer for yourself and there are the questions your soul never stops asking. Soul questions may have been with you since birth or may have just run into you at a crossroads one day years ago and asked to tag along for a mile. That mile turns into a lifetime. You know those questions will be at your death bed, eyes still in askance of you. To remain a whole person when I become aware of the suffering my choices cause, I have to address it. I might address my choice by saying, “I will change this,” or “I don’t know what to do about this,” or by saying, “I am not ready to act on this yet,” or even by admitting, “I am not the kind of person who can change this and I am sorry,” but I can’t say nothing. I have to answer the living humans and wilds that are suffering as a result of my actions with something more than silence. That’s all from Amazon’s production line in China which makes the Echo and Kindle. 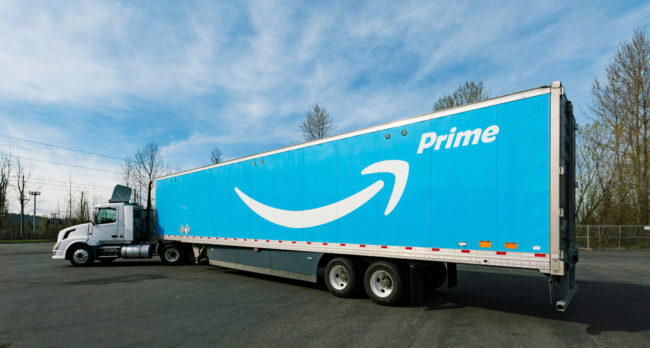 Amazon equals Walmart in the use of monitoring technologies to track the minute-by-minute movements and performance of employees and in settings that go beyond the assembly line to include their movement between loading and unloading docks, between packing and unpacking stations, and to and from the miles of shelving at what Amazon calls its “fulfillment centers”. at Amazon’s center at Rugeley, England, Amazon tags its employees with personal sat-nav (satellite navigation) computers that tell them the route they must travel to shelve consignments of goods, but also set target times for their warehouse journeys and then measure whether targets are met. 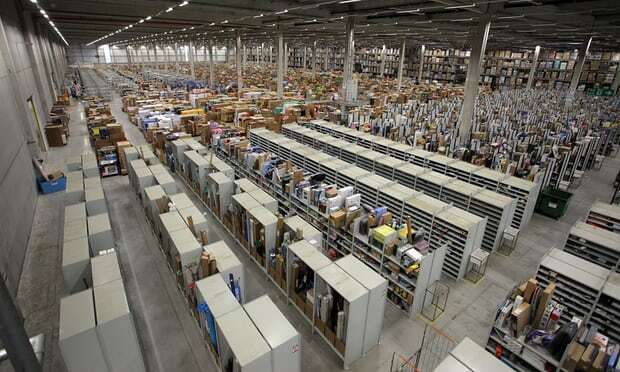 Whereas some Amazon employees are in constant motion across the floors of its enormous centers—the biggest, in Arizona, is the size of twenty-eight football fields—others work on assembly lines packing goods for shipping. 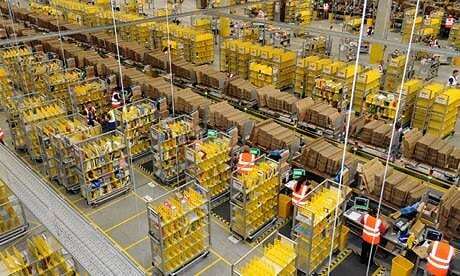 An anonymous German student who worked as a temporary packer at Amazon’s depot in Augsburg, southern Germany, has given a revealing account of work on the line at Amazon. 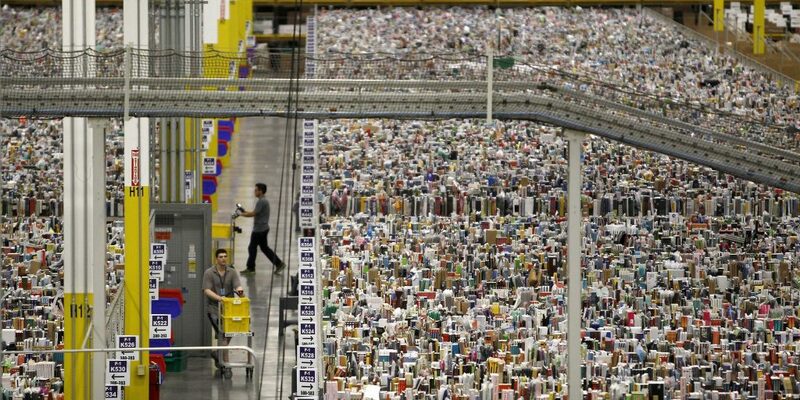 There were six packing lines at Amazon’s Augsburg center, each with two conveyor belts feeding tables where the packers stood and did the packing. Machines measured whether the packers were meeting their targets for output per hour and whether the finished packages met their targets for weight and so had been packed “the one best way.” But alongside these digital controls there was a team of Taylor’s “functional foremen,” overseers in the full nineteenth-century sense of the term, watching the employees every second to ensure that there was no “time theft,” in the language of Walmart. On the packing lines there were six such foremen, one known in Amazonspeak as a “coworker” and above him five “leads,” whose collective task was to make sure that the line kept moving. Workers would be reprimanded for speaking to one another or for pausing to catch their breath (Verschnaufpause) after an especially tough packing job. This is just one part of consumerism’s life-destroying shadow. What Pickle and I are doing can seem like just two weirdos doing their crazy thing in the woods (and sometimes it’s just that), but under it is a response to this shadow. If my lifestyle means I couldn’t face those factory workers, means I have to push them out of my vision and bury my awareness in order to function, then I am fragmented. I am building a life based on avoiding painful truths. I think avoiding this stuff makes for a half-alive person. I think industrial growth society would have us all continue as half-alive. It makes us buy more. What would it feel like for us if in the packaging of the new gadget we bought or Amazon streaming service we used, we saw the exhausted mother in the Foxconn plant falling asleep at 5am while brushing the dust out of our Amazon Smartspeaker only to be angrily woken up by a scared manager who might fire her on the spot? What would it be like if every time we bought something on Amazon, we could feel the tension in our overworked bodies of knowing we have our every movement tracked by machines and managers, and to feel in the soles of our tortured factory floor feet that we’re disposable, we have nowhere else to go, and that the robots are on the way to replace us? What if for our children and our neighbors’ children, factories and warehouses like these become the only job left they can get? Would we still overnight ship that one last thing from Amazon? or would we finally begin the fearless asking of what we personally could do to create a world where we don’t need any of this? I know I’m not alone, but these questions hang unspoken for me in so many moments leaving me feeling afraid, alone, separate, helpless. It makes a body want to go move to the woods and learn to eat weeds. Dazzled by the rattling music of seed packets, you buy a bunch of seeds to start a garden. Maybe for your first garden you get twelve different kinds of plants. For two of those plants, it turns out to be too late in the season. You can’t plant them now in this region. Oops. Four of those plants you place carefully in the rich well-drained soil keeping them evenly moist and yet, they never show a sprout; they stay sleeping in earth, faces unrevealed. Maybe three of them rise up and sprout but don’t ever really seem to “go” – they stay small, waiting for some encouragement you can’t figure out how to provide; or, they grow and grow tall, your hopes riding them to the sky, only to abruptly fall over leaving some twilight mammal to delight in their lilting remains. Then there are the two that see just how out of your depth you are and decide to take care of you. Maybe it’s peas and an unkillable purple kale or a mutant okra reaching to pierce the sky and that one squash vine that laughs at your first attempts at a “trellis” and begins conquering your rain gutters instead, fruiting baskets of ancient fruits (that you haven’t yet learned to cure, cook, or enjoy) incidental to its takeover of your roof. Saddened and maybe even peering over the cliff of despair at the unexplained failure of all your lost crops, the two kind ones that worked become your new mother and father and cradle you. They hold your shaky hand when you offer one of your weird small eggplants to a neighbor who of course has had a garden before where they grew dozens of varieties of eggplants all just like the pictures in the brochures and yet still they graciously accept your humble offering from the earth. It’s enough to keep you going and to secretly have conscripted you for life in an apprenticeship to Emerald Growth herself as she teaches you season by season to make a home for each of her seeds. This year was the first “big” garden I ever grew. Having apprenticed myself to plants for a few years now, I still felt the anxiety of the seeds that never broke soil, of the kales that disappeared, of the beets that could barely feed a dieting grasshopper. What would happen? This year, a great mercy happened. The garden grew. In the compacted dry sandy soil that was formerly pine forest and is now of a tiny shady 1/8 acre gap in the woodland, the plants that had been carrying me to this moment decided to throw me a surprise party by all at once gloriously showing up. For a beginner, our weather had been unspeakably merciful. Things took a little longer to germinate than I expected and grew slow at first with a kind of patience I struggled to have. Come April, the plants leapt up; into May, they jungled. Now in this, my first “big” garden, I have an embarrassment of friends around me. Choose an area and plan as many 3′ wide garden beds as you can fit. Consider spirals, keyhole shapes, curvy beds. There are secret advantages to these shapes. Let the tall weeds that want to grow up grow up. Let them get tall. In fall, cut them at the low part of the stem with a sickle or scythe. Don’t dig. Lay them down in the shape of your garden beds. Cover the cut greens with cardboard and / or lots of paper and / or old cotton sheets. Get whatever bulk organic matter you can. I used free leaves from the city leaf pile and free spent mushroom straw from an oyster mushroom farmer – so, leaves and straw – but you could use woodchips, forest leaves, grass, newspaper, straw, etc. etc. Pile it up many inches high over the cardboard etc. Mix in wood ash and charcoal in decent proportions. I sprinkled on quite a bit of wood ash for the minerals more than anything. Optional – let your duckies (if you should be so lucky to have them) hang out on it. They’ll sleep on your fluffy bed of stuff and poop all day long. If you don’t have duckies, use your pee. If you don’t have the privacy to pee on the garden, consider a pee bucket you spill out onto the garden once a day. It won’t get stinky if you empty it once a day or if you add a bunch of charcoal. Let it sit until early Spring. Fence the duckies out then. If the bed hasn’t broken down into soil (ours didn’t), make a “trench” in the center of all that partially decomposed organic matter about half the width of the bed. Dig some native soil from the paths next to the beds and mix it with an equal proportion of compost (this was our only expense – one $30 truckload of compost). Add a little wood ash to counteract pH of native acidic soil (if it’s acidic). Plant into this! and once plants germinate, spread the mulch in the organic matter on each side over them. By Fall, this whole bed will hopefully be broken down enough to plant into all 3′ width of it; but in the meantime, you get a very well mulched nutrient rich aisle that seems to be able to support dense growing of plants. This was enough to make a home for seeds and transplants that continue to nourish us each day. Here are the main plants I imagine we’ll be locally depending on for food on our land by 2025. Notice what is not there – many of the delicious but increasingly hard to grow annual vegetables we’re used to. This is based upon my beginner’s understanding of growing food in our specific area and of how climate pressures will change what can do well without increasing amounts of time and material inputs. There are also of course dozens of other plants we’ll depending on more for medicine and so many other needs not listed here. Right now, almost a hundred new trees stand in our soil, the most vital parts of their bodies entirely out of sight, dreaming. I fret over them wondering if any will live at all. Bare root, as inexpensive trees as we can get. Before this I’d only planted a handful. The number of things I don’t know are infinite, and the few kinds of care I do know how to give make me feel happy in a way that is new. This is care I can give. I haven’t tested the soil, but I know it’s acidic and so a sprinkling (is it too much, too little?) of wood ash around most of my trees can help. Wood ash raises the pH and fills the soil with trace minerals. The Permaculture maxim “the problem is the solution” fits here, because the problem (acidity) is an opportunity for me to safely use greater quantities of the pH raising wood ash without causing the soil to get too alkaline; then the trees also get the benefits of an impressive range of nutrients that they’d otherwise struggle to find with new roots. Of course I also added lots of biochar. Meanwhile, the rain and clouds kept a rhythm that was just right. It stayed cool long enough that I think most of what I’m planting would stay dormant. We’re still water scarce, so watering in all those trees and shrubs wasn’t an option; yet the rain came as needed, soothing my worry. When the dance with the weather goes this well in the 21st century, it is a miracle too easy to miss. Can we grow food in the understory here? I always hear mixed things. Many plants are an experiment in that. Especially curious about hazelnuts in a pine understory. I planted tag alders (n-fixers, small tree) directly in the garden bed. How will they cooperate with the plants? Can I use them as living n-fixing squash trellises? Is it true that the part shade of a small tree can increase garden productivity in the Southeast? We’re hoping for tree hay (i.e. – perennial fodder for animals that sequesters carbon) from the tag alders and black locusts. I know folks in the mountains know how to do this. Can we grow an orchard between black locusts in the Milpa, and can those same locusts provide us building material via coppice? I planted a pattern of tag alders above blackberries on an eroding slope in a loose terracing. The hope is that the tag alders’ shallow root systems and fast growth will stabilize the eroding ridge while giving nitrogen to the blackberries. Can we start some fruit trees in the relative gentleness of a partially shaded area with plans to open it up as they mature, thus helping them grow in more moderated conditions until they’d reach a fruit-bearing age? What magic will happen when we add so much diversity to the forest that wasn’t there? Do these plants want to be here? How will the forest community welcome them? 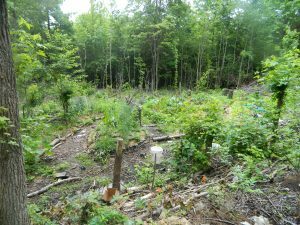 Is the way of planting trees I more or less made up going to actually work at all?